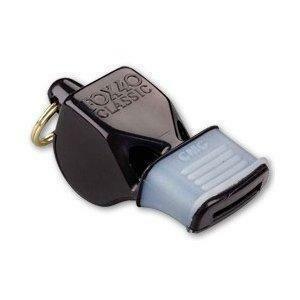 A Cushioned Mouth Grip (CMG) enhances the original Fox 40 Classic Pealess Whistle. Innovative thermoplastic material provides superior grip and protection for your teeth. The Classic CMG is ideal for sports officials who need to hold the whistle in their mouth for extended periods of time. Better Grip. Better Control. Better Protection. Design: 3-chamber pealess with added CMG. Sound Power: 115 dB.